Cerodontha (Butomyza) angulata (Loew, 1869a); Spencer, 1976. Fauna ent. Scand. 5(1): 204-5, figs 354-6. Cerodontha (Butomyza) angulata (Loew, 1869a); Spencer, 1990. Host specialization in the world Agromyzidae (Diptera) : 347, 348 (fig. 1317), 351, 371, 380. 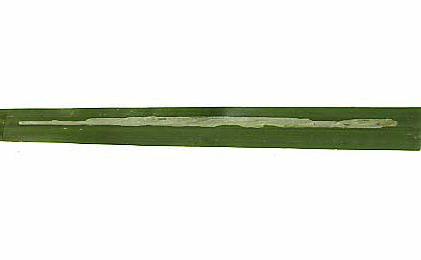 Leaf-mine: A long yellowish green leaf-mine. 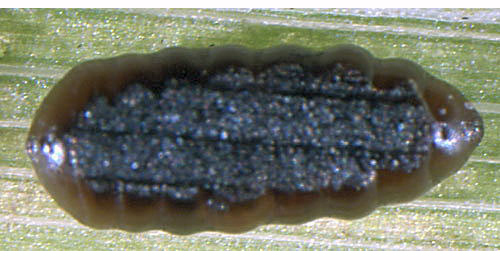 Pupation external, puparium frequently adhering to leaf (Spencer, 1972b: 100; Spencer, 1976: 205). The larva is described by de Meijere (1926, as semiposticata), Nowakowski (1973) and Dempewolf (2001: 113). The larva is illustrated in Bladmineerders van Europa. Oval, dark brown, without conspicuous segmentation, frequently adhering to leaf (Spencer, 1972b: 96 (fig. 331), 100; Spencer, 1976: 205, figs 355-6). Yellow to black-brown (Bladmineerders van Europa). Time of year - mines: September, November. Distribution in Great Britain and Ireland: Widespread in the southern Britain including London (Hampstead), Middlesex (Scratch Wood), Dorset (Lyme Regis), Glam. (Spencer, 1972b: 100), Warwickshire (Coventry) (Robbins, 1991: 133) and Cardiganshire, East Sutherland, Leicestershire and Surrey (NBN Atlas). Distribution elsewhere: Widespread in continental Europe including Denmark, Sweden, Norway (Spencer, 1976: 205), The Netherlands, Luxembourg (Bladmineerders van Europa), Belgium (Scheirs, de Bruyn and von Tschirnhaus, 1995), Germany (Spencer, 1976: 554; Dempewolf, 2001: 113), Austria, Czech Republic, Estonia, European Turkey, French mainland, Hungary, Italian mainland, Lithuania, Poland, Romania and Slovakia (Martinez in Fauna Europaea). Also recorded in Canada and the U.S.A. (Spencer, 1976: 205).